On the 1st of January 2019, Romania was set to take over the rotating presidency of the Council of the European Union, the first time since it joined the European Union in 2007. In 'Use article 7 against my country', Radu Dumitrescu argues that "the only solution to deal with Romania’s rogue, mob-run government is for Brussels to activate Article 7 and leave the country without EU funds". 'Use article 7 against my country' is on the shortlist for the European Press Prize 2019 in the category 'Opinion'. On the 1st of January 2019, my country is set to take over the rotating presidency of the Council of the European Union, the first time since it joined the European Union in 2007. For over a year now, the political sphere of Romania has been filled with calls for the opposition and governing parties alike to band together in order to further the “national interests and agenda” of Romania as it holds the presidency. In the meantime, however, the S&D-ALDE government has routinely used such calls for unity in order to silence criticism of its acts – among which a vast, prolonged and ongoing alteration of the laws concerning the functioning of the judiciary, which empowered the minister of justice and granted him control over supposedly independent prosecutors. The same changes would mean that the president of the Social Democratic party of Romania, the twice-convicted (but somehow still president of the Chamber of Deputies) Liviu Dragnea, would walk scot-free. Two years ago, protests sprung up in opposition to such changes, the most famous of which being Emergency Ordinance 13, which set out to virtually decriminalise official misconduct in cases where the damage to the public finances was less than €42,000. The largest protests ever since the 1989 revolution followed, with crowds dotted by European flags and cries for “Mutter Merkel” to help. Then came the violent crackdown of the police against the protests on the 10th of August 2018, during which the Romanian Gendarmerie freely made use of gas and violence, hospitalizing some 500 people and attracting the criticism of the European Commission, the US State Department, and other external partners. Coming back to now – this month, at the 12th hour, it has become clear that Romania cannot successfully fulfill the demands required by the presidency of the European Council. The president, ever at odds with the government, argued as much, causing panic throughout European capitals. There is no plan, there is no competence – since professionalism and competence are ill-regarded by the One Party. Then the minister in charge of EU Affairs, perhaps one of the most competent members of an otherwise shameful cabinet of populists and cronies, resigned or was forced out, in just another of PSD’s behind-the-scene scandals – the same party which removed two prime ministers due to the fact that they proved unwilling to obey Dragnea. Romania is a rare specimen in the European family, in the sense that it has no visible Eurosceptic party, be it far-left or far-right. For that matter, it doesn’t have much of a far-left or a far-right. Part of the reason is that the mainstream, governing Social-Democrats have so enveloped the electorate likely to listen to such nationalistic, xenophobic or anti-EU calls with a thinly veiled economic and nationalist populism that there is no room for typical extremist parties. So far, PSD has managed to control its elderly, rural and less-educated voters, but the recent spat with Brussels may convince the pragmatic Social Democratic leaders that the time has come to turn on the throttle of Euroscepticism and nationalism. Already, the more daring left MPs have started speaking of a “Romanian civilization” that is superior to that of Western Europe. It has become clear that the PSD-ALDE government of Romania is not interested in hearing feedback from its people or its external partners. While it treats the latter to lies of cooperation, domestic peace and rule of law, it sends the police to trample and gas the former. The recent report within the Mechanism for Cooperation and Verification – painted as an anti-Romania conspiracy by PSD mouthpieces – which monitors the rule of law within Romania and Bulgaria, has scolded the first while praising the second, in a role-reverse that has occurred since PSD re-took power in 2016 and set out to dismantle any form of judicial independence. For all of these reasons, the only solution to deal with Romania’s rogue, mob-run government is for Brussels to active Article 7 and leave the country without EU funds – which support over 60% of the public investments being made in Romania, as the state budget is squandered on pensions and the ever-rising paychecks of public workers – or voting rights. To remind the readers, Article 7 of the Treaty of the European Union represents an infringement procedure that condemns and then sanctions member states for their violation of the fundamental rights guaranteed by the EU. It was introduced in order to allow the Union to deal with countries and leaders that were governed by xenophobia and autocratic tendencies, such as present-day Hungary and Poland. The conclusion of the application of Article 7 would render a state without voting rights in the European Council. 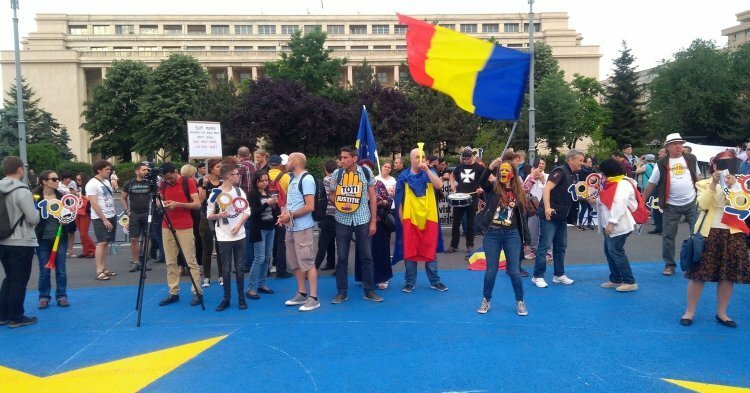 These days, a debate roars throughout Romania – is it treason for Romanian MEPs to unveil the Romanian government’s wrongdoings before the European Parliament and the Commission? Such a question runs deep within pro-Europeans, and federalists most of all, and the answer is plainly obvious – of course not! A country’s government is not its people, and any criticism directed at it is not meant for the entire country. To argue otherwise is to misrepresent what the EU stands for and how the democratic system of government functions. And that is exactly what populists and nationalists bring before the electorate – hatred, fear and lies, while grabbing as much as they can out of the EU funds. We have seen it in Hungary, we have seen it in Poland, and now it is there for everyone to see in Romania. So use Article 7 against my country. Skip us, for the moment, when it comes to the presidency of the Council of the EU. Leave us without voting rights. Take away the funds, lest they fall within the greedy hands of the corrupt, whom the fearful and the ignorant keep in power because they wave the flag and point at the foreigners. Moreover, remove PSD and their ALDE allies from their respective European families, even at a steep electoral cost. To my countrymen, I say this – you are being manipulated by a false sense of unity invoked by those who kept you in poverty and ignorance since 1989. To love your country does not mean to defend its crooks in front of prying foreign eyes. It means doing everything to rid your community of them, so you can finally stand upright as a member of the European family. Corruption is not the national shame, it’s the national disease. This time, however, we are not alone against it – and Brussels is the cure.